News 8's High School Football Game of the Week is back for another exciting season! Over the years, we've counted hundreds of thousands of votes between three great macth-ups each week, and that tradition continues again this year. Sports Team 8 will select three of the top games across the state of Connecticut each week. You're invited to cast your vote for your favorite, and the game that racks up the most votes will get LIVE coverage from News 8 on game day! From the players and coaches from both teams, to the bands, cheerleaders, color guards, booster clubs, and everything else that makes Connecticut high school football so special, News 8 is proud to bring you the best games in the state every week this season! Visit this page often to cast your votes and check on the vote totals. Each week's winner will be announced on News 8 at 6:00 p.m. Wednesday night. Match-ups for following week will be available starting at 11:30 p.m. Friday night, following High School Football Game of the Week highlights on News 8 at 11:00. 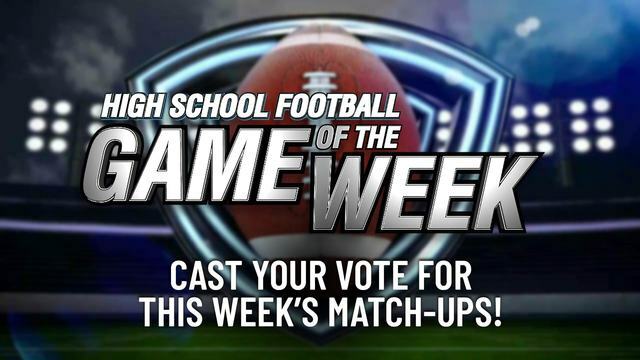 Which match-up should be the News 8 High School Football Game of the Week?